This archive holds all posts form June 15, 2009. 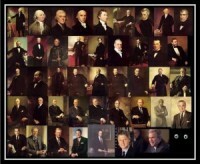 As you may or may not be able to tell from the image, it depicts all the presidents of the U.S. through to the current one, and in place of a portrait of President Obama, there is only a dark square with two eyes peering out. The image evokes the racist blackface iconography characteristic of the Jim Crow era. Just as we witnessed during the campaign, racist imagery has been a consistent feature of the white response to Obama’s emergence on the national political scene. The fact that this came from a state government office suggests that this sort of white supremacy is not relegated to some marginal, fringe element of the population, but rather resonates within the mainstream of elected politicians. If there’s a bright spot here, it’s that someone – an unnamed administrative assistant – thought that the image was wrong and forwarded it to someone outside her office. It’s these kind of ‘race traitors’ that can work to disrupt the persistent repetition of the drum beat of white supremacy. former chairman of the Richland County GOP, was an early backer of George W. Bush and co-chairman of Rudy Giuliani’s 2008 campaign in Richland County, the state’s largest. Eric Davis, the current chairman of the Richland County Republicans, said his predecessor should get a pass. “Everyone says stupid things they regret later. I think the world should move on,” he said. Racism is just no big deal for many white Americans. See too how that old white racial frame is powerful, as whites just cannot seem to let go of the ape imagery for Americans of color. This stuff is hundreds of years old. One finds it in Thomas Jefferson’s Notes on the State of Virginia, our first major book by our first secular intellectual–and white supremacist thinker. Why are white men so slow to learn about what is blatantly racist in our post-racial America?